Character. Cost: 4. STR: 4. 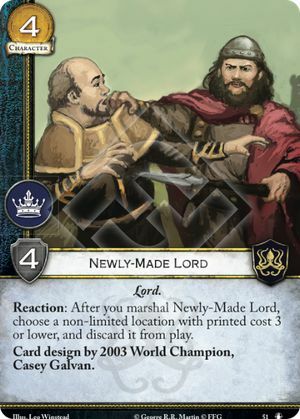 Reaction: After you marshal Newly-Made Lord, choose a non-limited location with printed cost 3 or lower, and discard it from play. Card design by 2003 World Champion, Casey Galvan. "Alright mate," he said. "Nice Plaza of Punishment you have there." "Yeah," the man replied. "It's going to burn your 2 cost character in a minute." "Nah mate." "U wot m8?" The man picked up 4 gold.